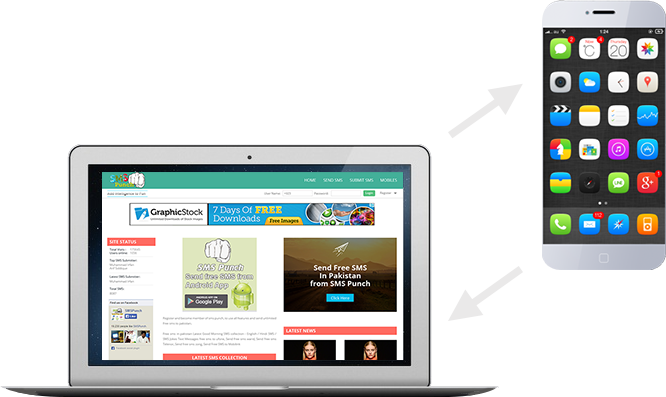 SMSPunch is the largest portal to send free sms to Pakistan, moreover, you can also receive replies from your loved ones directly on your computer's screen. Register yourself now and start sending unlimited sms to Pakistan without paying any single penny. SMSPunch is the best and free platform to send free sms to Pakistan to any mobile network including Ufone, Zong, Warid, Mobilink Jazz and Telenor. Not only you can enjoy our Pakistan free SMS service but also you can receive texts in your inbox available on SMSPunch. Furthermore, overseas Pakistanis especially living in UAE and Saudi Arabia can enjoy our free SMS service and also if they want to enhance their text messages’ sending speed then they can simply buy our premium package. Moreover, there is no characters’ limit for premium users* and for free users there are enough words available to send in one message. To send free sms to Pakistan, simply register yourself on smspunch and start sending text messages to your loved ones. Why we Provide this Free SMS service for Pakistan? I know many of you are wondering that why this free sms website is important and who are seeking this kind of service, people who are living outside the Pakistan always try to find free source of text messaging because sms prices in foreign countries are very high. SMSPunch has especially designed this fast free sms service for those who are living outside Pakistan, but Pakistani nationals can also send free sms by using this service. Moreover, SMS is becoming a fastest way of communication and every age group is using sms to communicate with others. If you want to send free sms of more than 1000 or 1100 characters then you must have a premium sms service and don’t worry that’s really affordable for every class. Web2sms and free sms services from internet websites and also from Android/iOS apps is the future of communication because nobody want to waste their time and money on mobile phone cards because they can get these free services on their computer without even unlocking their phones. Another reason of popularity of free sms portals is that inhabitants of Pakistan are required to pay more than 30% of taxes on every recharge of cards and they only get 70 rupees on recharge of rupees 100 worth card. Then why don’t we use these sms sending free services? Why wasting our money? So don’t do that from now and send free sms from smspunch. Furthermore, we can provide this sms service free of cost without registration but we’re registering people for their own protection, so nobody can use this service without registration and also he/she must has to verify his/her identity before start using this service. Yes, SMSpunch’s service is for everyone and anyone can send unlimited sms to Pakistan on any network and also we’re supporting sms on ported Sims and numbers. If you’ve any query regarding sending free sms from internet to mobile by using smspunch, you can use our contact us page for any kind of help. SMSPunch is proud to launch first Pakistani Smartphone SMS Sending and receiving application. This app is available for Android user to send free SMS to Pakistan on any network. Users can send unlimited SMS to pakistan in just seconds on single click using internet wifi or GPRS.